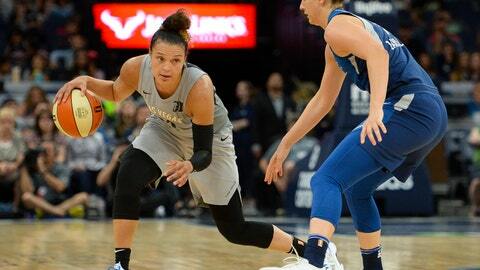 “To all of our WNBA fans around the world, We regret that the Aces were not able to take the court tonight against the Washington Mystics,” the statement said. “We trust that you know this decision was not made lightly. There is nothing we enjoy more than playing in front of the most rabid fans in professional sports night in and night out, and we sincerely apologize for any inconvenience and disappointment that was created for the fans, workers and anyone else who may have been affected by tonight’s cancellation. “It was Breast Cancer Awareness night and we were supposed to have 5-6,000 fans here,” Thibault said. The Mystics fly to Dallas on Saturday morning for a game against the Wings on Sunday afternoon. Moving the game to Saturday wasn’t really an option. The Aces were beginning a three-game road trip in D.C. with their next game Sunday in Connecticut. Las Vegas wasn’t the only WNBA team with travel issues Friday. The Indiana Fever were supposed to fly to New York for their game against the Liberty on Saturday. The Fever sat at the airport for three hours before being told their flight was canceled because of weather. There were thunderstorms in New York on Friday afternoon.